We are big Disney World fans. My first trip to Disney World was on my honeymoon back in 1994. Just starting out, we were on a tight budget back then and stayed at an Econo Lodge in Kissimmee. We took the motel’s complimentary bus transportation to and from the parks every day for a week and ate at a flea market next door since we had not rented a car. I immediately fell in love with the magical feeling you get as soon as you walk through the gates of The Magic Kingdom. All of their parks are wonderful with so much to look at and enjoy but The Magic Kingdom has got to be my favorite, plus it has the most rides! Since then we have had two beautiful children and have taken many trips to Disney World and have created some wonderful memories that will last a lifetime. 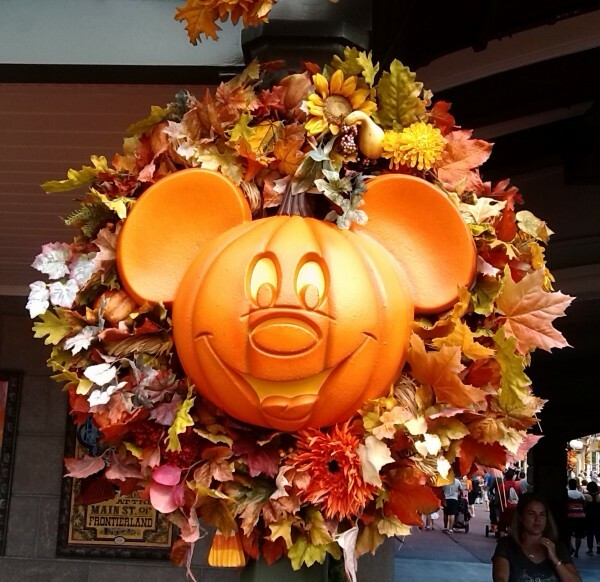 One of my favorite times to go to Disney is in the Fall when they are all dressed up for Halloween and there is Autumn flavor in the air. 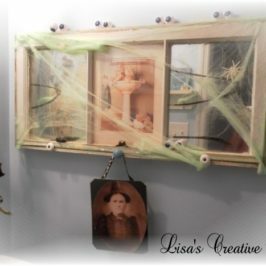 As you walk up to the entrance to the park you are greeted by a fabulous Fall garland that just makes you feel warm, fuzzy and giddy with excitement all at the same time. 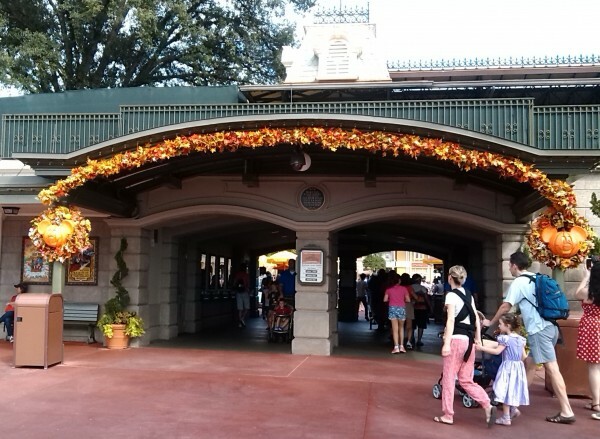 Flanking each side of the entrance are two beautiful Fall wreaths adorned with a Micky Mouse pumpkin. Too cute! These adorable wreaths are found on inside the park as well. 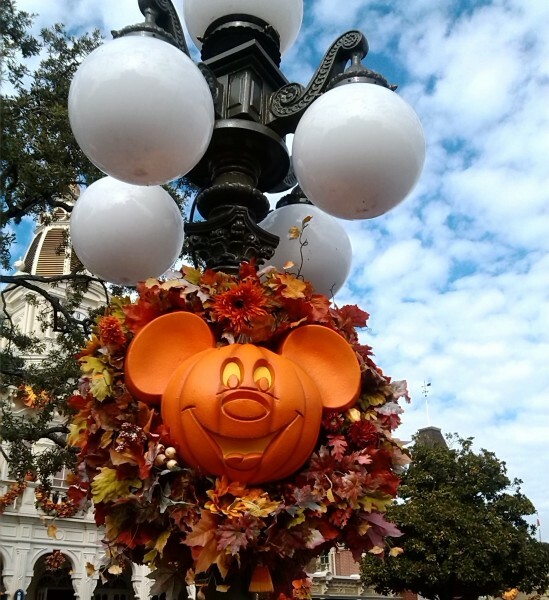 This one dresses up this charming lamp post found on Main Street. If you have never been to The Magic Kingdom, Main Street USA is at the front of the park and leads you straight to the famous Cinderella Castle. Main Street is my favorite part of the park. It has such charm and is full of quaint shops. 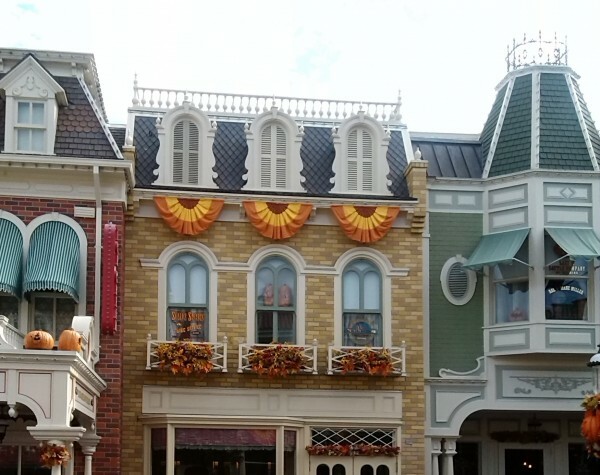 They decorate Main Street for Halloween as well. 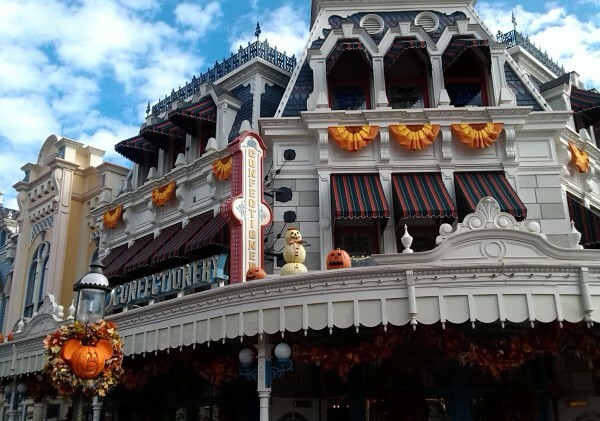 I love the little pumpkin “snowman” and the Jack O’Lanterns perched on top of the roofs. The orange bunting adds a nice touch too. 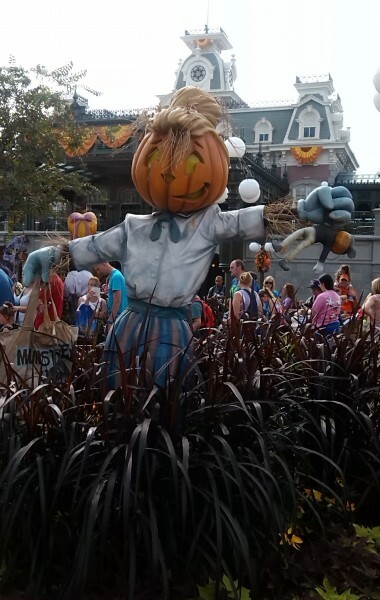 This delightful Pumpkin Head Scarecrow welcomes visitors as you walk onto Main Street. She looks as though she loves her job. 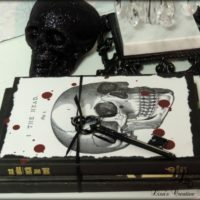 I just adore how they decorate their shop windows as well. Here’s Minnie dressed and ready to go trick or treating. 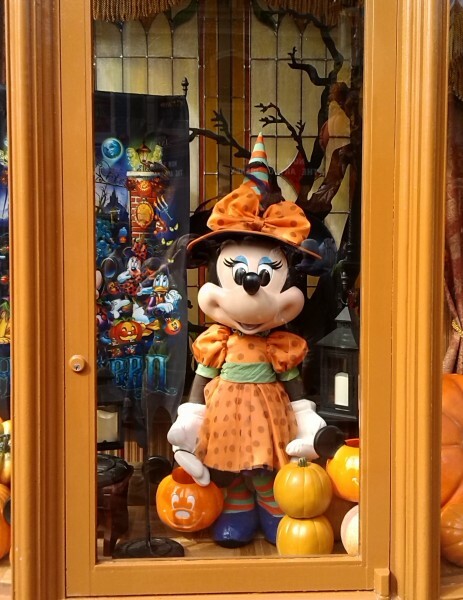 Mickey stands in another window ready to grab some sweet treats as well! 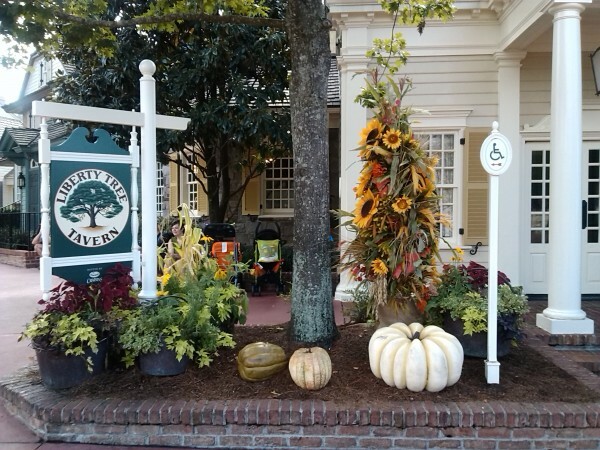 The Fall Garden outside of The Liberty Tree Tavern in Liberty Square is beautiful. Liberty Square is also the home of my all time favorite ride, The Haunted Mansion. I could go on this ride all day and never tire of it. I always see something new. If you love antiques you would love this ride too. 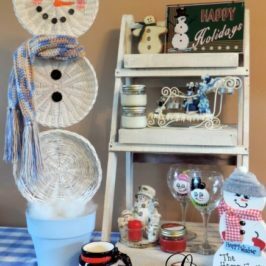 It is loaded with cool flea market finds. 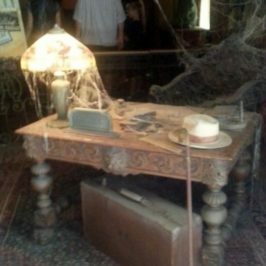 I always think “Wow, what a cool job!” I would have loved to be on the design team that created the Haunted Mansion. 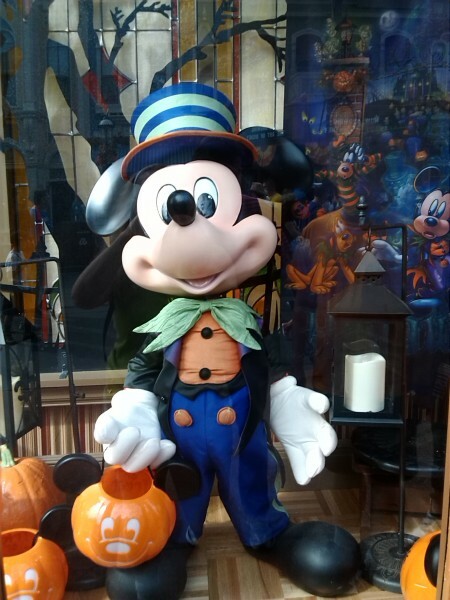 Last year we attended Mickey’s Not-So-Scary Halloween Party and it was great! They hold these parties after hours to ticket holders only. 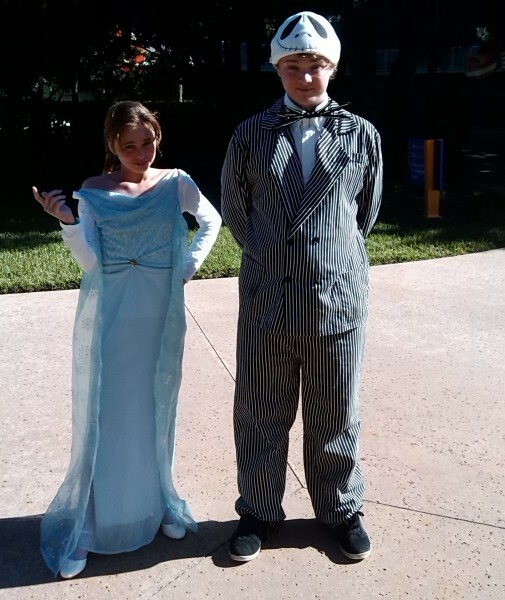 We dressed up in Disney themed costumes that I threw together. They hold a special Halloween parade that is awesome and we all got to go trick or treating in the park. It was a lot of fun and the lines for the rides were pretty short too. In my opinion paying the extra money to attend the party is worth it. 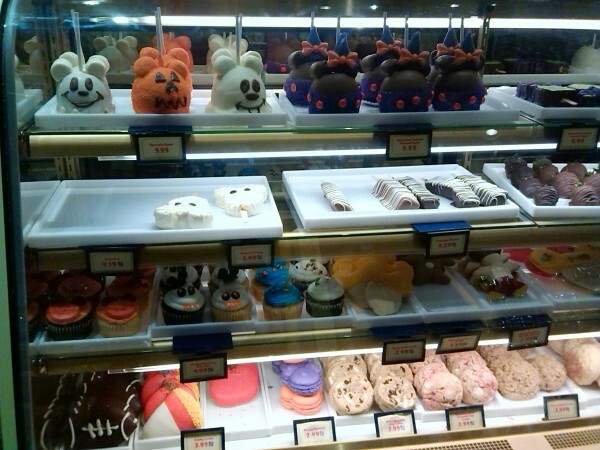 Speaking of treats, check out these sumptuous looking sweets found in one of the many bakeries throughout Disney World. 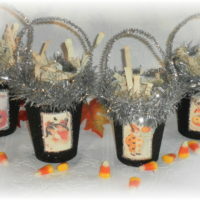 Candied Apples like you’ve never seen before, spooky cupcakes, candy corn cookies and other delectable goodies. I could feel my clothes shrinking just looking at them! 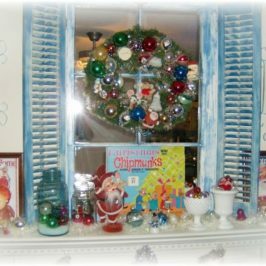 In a few weeks we will be heading to Disney World again just in time to see it decorated for Christmas which is just as magical. 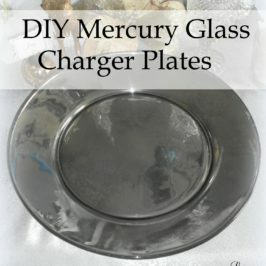 We have long since given up staying at Econo Lodges with leaky bath tubs and green pools. Now we always stay at a Disney resort. 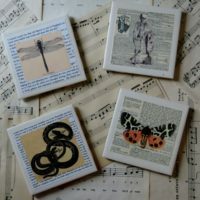 They offer perks to their guests that you can’t get anywhere else. I will be taking more pictures when we go and sharing them with you when we get back. 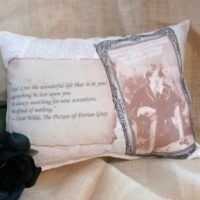 For those of us whose passion in life is decorating and decor, Disney is one place that don’t disappoint. 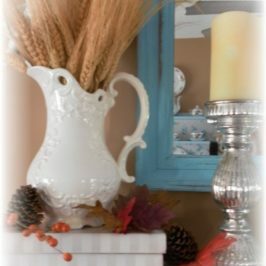 Hats off to the crafters, decorators and designers that make this place beautiful. How great would it be to have a creative job in one of the most magical places on earth? !